thinks he strained his voice from recording. BLOODY hell. alright. like seriously, no more ballads. your ballads are ________. oooo. managed to finish the demo for 会走更远 today. oh jiejun sandy's brownie is good too. but the one i had was REAAAAAAAAAALLLLY good!!!! alright this photo does not justice to that brownie. cuz half of it's been eaten, MUAHAHAHA but still. SALIVATES! oh but i tell you. ritz carlton has some really great views. esp above the 20th floor. saw the race cars speeding through the floodlight-lid tracks just now. wasn't really very exciting, perhaps because i was really far away, but they were still very loud. HAHAHA oh i was delivering some stuffs together with the bellmen, and we actually walked into this room and this old indian lady was still sleeping inside. opps! okay shagged now. after carrying lotsa juices around ritz carlton in the day. SHAGGS. omy. omy. how imbal can humans get? suddenly became VERY BUSY after 12am. KNS. okay going for malay class in a while. now at the room beside FAL. gonna work at ritz carlton starting tml. yeah then stayed on and went online for a while with rachel and her friend joyce at the cafe express. okay la it's not such a bad place actually. yeah then met bailu and melvin for ab213 discussion for tml's ppt. yay finally done something with them! PHEW PHEW. then headed to ob to have composition class with huan liang. okay needs to make everything less draggy. BLEAH. yah spent the whole day on BT313 proj and fixing the internet, and playing with my niece and nephew. ok. forseeing a very busy weekend ahead. 2 projs due next week. bloody hell. yeah then was very late for lectures. afterwhich went down to ob to prac and record vid with daryl, zach and miaoru. went to SPH to send the video this morning. then headed for school. met yao feng on the train just now. such a coincidence! okay i am abit lost. doesn't know what to blog about. but just wanna finish my projects and meet nelson to discuss about argentina tml. and also prac for hdb performance during mooncake festival, and continue to compose songs, and learn guitar. at city hall starbucks again doing BT313 project with rachel and hamizah. ponned malay class and bt201 again. HAHA at least we are making some headway with regard to what our product is! hahahah we are going to be successful businessman and businesswomen in the future :) okay yes and i met ivan at starbucks. HAHA! oh it's based on the chords that ivan gave me for olivia's i'll move on that miaoru is singing. learnt from suelynn a few weeks ago that we should treat everyone as if he/she is our best friend. seems to be lagging at everything except the pace at which i am watching one piece. MUAHAHA. ah. not looking forward to the AB213 project meeting later, if there is any. went to sis's place in the morning to celebrate her birthday. hahah i really like alicia and leroy's baby skin! so soft and great to touch. muahahah i am paedophilic. muahahah yeah anyway i am feeling happy to know that mom is feeling much better and much happier now. the CROWDED pri school canteen. and nobody would believe that i took this at cat high just outside one of the science lab. then we went to siglap together. had choir prac. so nice to see bing and jiayun again!!! :P yeah and the songs for choral elite are nice! wanna strum the guitar and sing along with it. loves olivia ong and 小宇. :) feels blessed with music in my life. 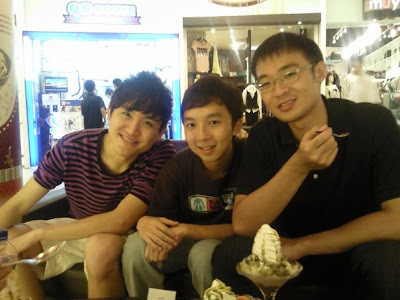 had dinner with daniel, yy, samuel and melvin at amk yesterday. yeah then we went over to amk hub MOF for desserts. very full. okay now melvin will be gone for like 1 year plus. COME BACK SOON AR!!! HS813's Margie Hall is getting more boring and boring by the week. am currently awake for the 20th hour. woohoo! finally some action after days of inaction. okay that's a stupid statement. haha after that fought through the rain and managed to reach pacific coffee at ob and sat down to study. met miaoru, julio and daryl, heard some not very positive news, then headed for lunch at maxwell. was supposed to have dance lesson with julio, but had to rush out my demo, so headed down to zach's with miaoru. had fish head steamboat and pan-fried tofu with them. yeah thanks guys for helping me with the demo!